Chapter 2: How to come up with ideas for your online course. In this chapter, we’ll tackle the most important part of getting started with your course: your topic. If you want to know what can make you money in the future, look at what’s making you money now. Are you the “go-to person” at work for solving a particular problem? Do your friends or neighbors pay you to help them with something in your free time? If so, that’s a perfect subject to create an online course for, because you’ve already validated that people are willing to pay you to help them with it! Okay, so nothing comes to mind that you’re already being paid for. That’s okay! Just move on to this next step. First think about your audience. If you already have a blog with an email list, you should start with them. Or if you have a handful of followers on social media, use that platform. Or, if you don’t have an “audience” already, simply look to the people around you: your friends and co-workers. Even members of online communities that you might hang out in (more on that below) can be tremendous sources of topic ideas. We’re going to pull our profitable idea out of these people. It sounds simple, but it works. I’ve personally used this approach to come up with courses, blog content topics and even offline business ideas. Asking them 5 questions each. Use the questions below to uncover challenges that people are willing to pay to have solved. This is extremely open-ended and lets the interviewee reveal what’s top of mind for them, rather than being led by your question. Now we’re going deeper into their pain points. This will be the solution that you’ll need to create a better alternative for! This is WHY someone would pay for your course. It’ll come in handy when you’re writing your sales copy. This will help you uncover other content on your topic to learn what works (and what doesn’t), as well as find more useful places to get additional research and students! Remember: when you hear something interesting, dig deeper! Ask the other person to expand on things, or ask them why they feel a certain way about something. The deeper you go, the better you’ll understand peoples true challenges rather than what they say on the surface. Let’s say you’re trying to find out why someone dislikes doing a particular process. We’ll use cooking as an example. But that’s not specific enough for us, so you push on: “interesting. What is it that you find so intimidating about it?”, you ask. They’re scared of complicated recipes that require a bunch of ingredients and tools they don’t have. They hate washing dishes, and that’s enough to keep them from making even the simplest meals. They’re afraid to cut themselves chopping an onion (it happened to their cousin’s babysitter’s friend once). See how much deeper these responses go? When you understand your students’ fears at this level, you can help them overcome those fears and actually succeed. But if all if you know is that they find something “hard,” where do you even start to help them? What if you don’t have a side business or an audience? Or if you simply want to try digging for ideas without bugging anyone? We’ve got you covered with a couple of research techniques designed to help you identify gaps in the market where you can deliver value that people are already looking for. First, think about a broad topic. No need to get super-specific here, but think more broadly about something you’re interested in. We’ll use “cooking” as an example again. Remember: any problem worth solving in a course has probably already been written about. And if it’s a real problem for people, they’re probably seeking solutions online. The beauty of a massive community like reddit is that there are sub-communities (“subreddits”) about nearly every topic. So let’s find what people are saying about those problems, and see what new opportunities we can uncover. The key is separating the useful information from the noise. Discussions of specific cooking problems that people are struggling with are useful to us; general conversations about cooking are not. So to hone in on the challenges that people have, we’ll use terms that indicate that someone is struggling with something. As you find ideas for topics you could tackle in a course, write them down. Don’t worry about evaluating the ideas just yet. Don’t get hung up on whether something is sellable or “interesting enough”. Just focus on finding as many challenges as you can, and make a list. Still stuck and need some inspiration? Check out these 72 real-life examples of course ideas that make money. Then, move on to the next step: choosing a course topic. By now you should have a list of potential online course topics that you could tackle. Now let’s hone in on the best ones. Passion: How excited are you to work on this? If you hate working on something, its’ profit potential doesn’t matter, because you’re likely to quit before you get there! Profit Potential: Is it a problem that people would pay to have solved for them? A good framework for thinking about this is “do people already spend money to solve this problem, in the form of books, apps, services, etc…?”. 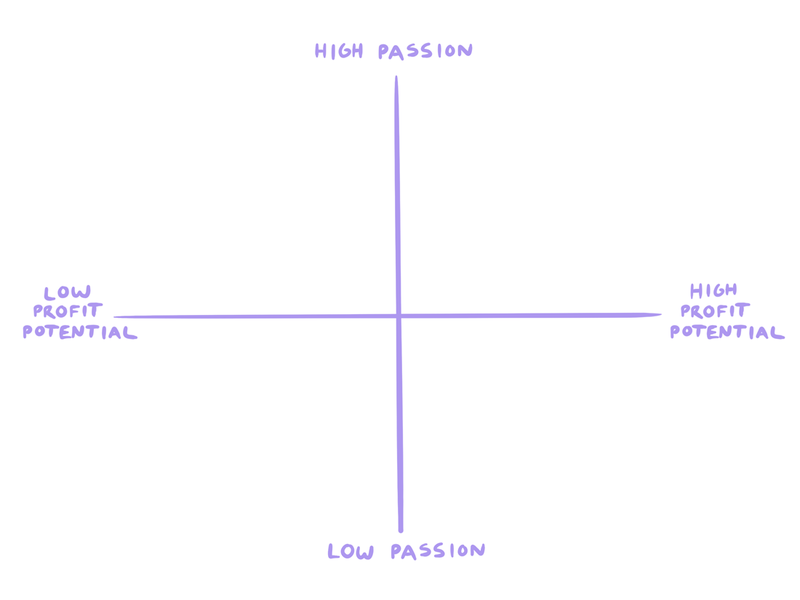 Plot the ideas from your list on the Passion/Profit Matrix below. 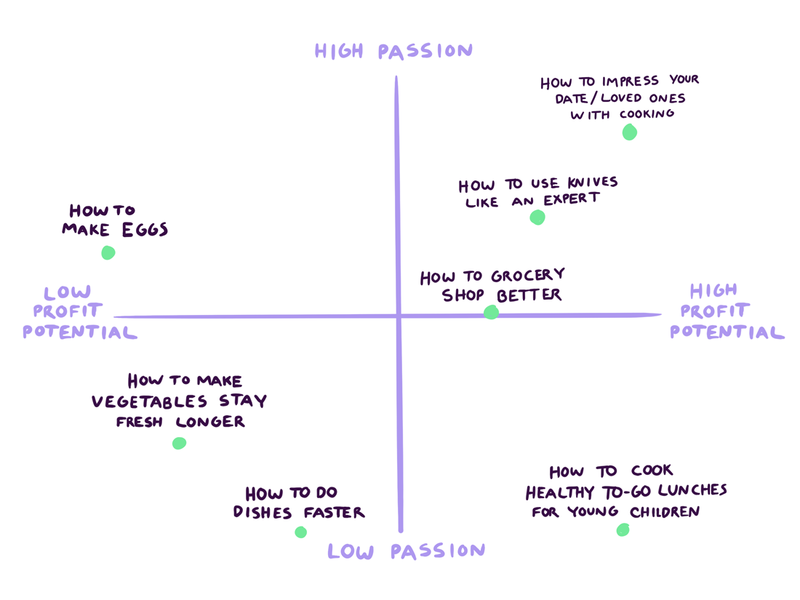 We’re looking for the ideas that land in the top right quadrant: the ones that you’re excited to work on and that you’ll be able to sell. 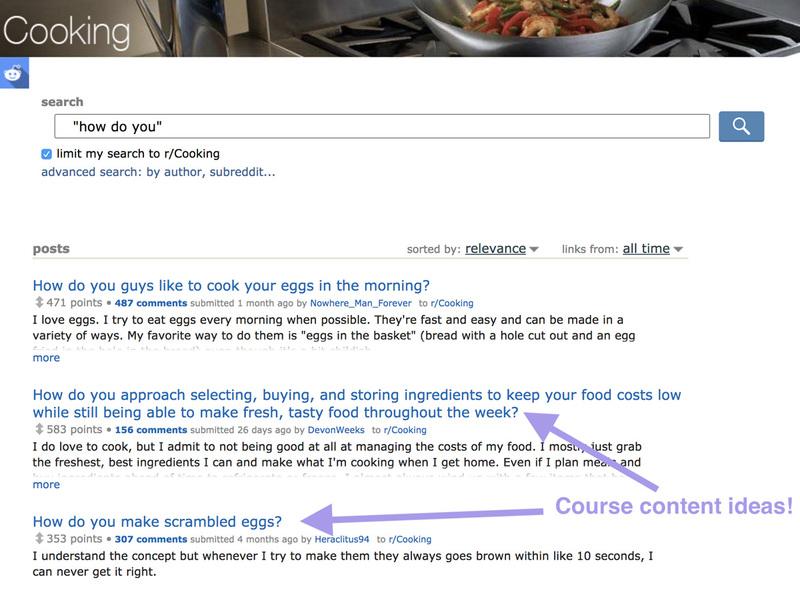 In this case, “How to make eggs” is probably not a great idea because while I’d enjoy working on it, not that many people seem to struggle with it. I’d also skip “How to cook healthy to-go lunches for young children” because although it’s a common problem, it’s not really something I’d enjoy tackling. But “How to grocery shop better”, “How to use knives like an expert”, and “How to impress your date/loved one with cooking”? Those are all excellent online course ideas with a lot of potential! Once you have your idea chosen, it’s time to get to work on building your course. A model for how to think about what content you’ll need (and what questions you’ll need to answer).